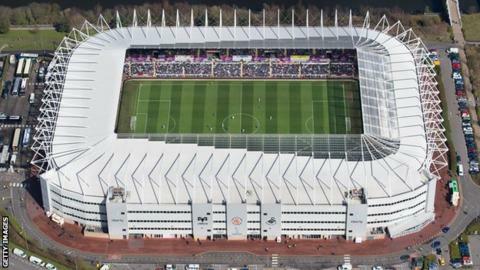 American investors in talks about taking over Swansea City want to buy around a 60% stake in the club. Jason Levien and Steve Kaplan had initially been negotiating a deal which would have seen them acquire more than 75% of the shares. That would effectively have given them complete control, including the power to issue more shares. The new deal will protect the influence of the Swansea City Supporters' Trust, which will retain its 21% stake. Had Levien and Kaplan bought the initial stake of 75%, their ability to issue more shares could have diminished the value of the trust's shares. The trust's Jim White had previously told BBC Wales Sport he and his fellow members were seeking "assurances" from the Americans, as a 75.1% share should have seen them hold sway over other shareholders. Swansea had already confirmed chairman Huw Jenkins and vice-chairman Leigh Dineen would keep their roles in the event of a takeover. At this stage, it is not known how many shares each shareholder will be selling. Levien and Kaplan, who have been in negotiations with Swansea for months, will not comment publicly until a formal agreement has been reached. The deal is expected to be completed by the end of the current Premier League season.